At Milex, we know your vehicle’s steering and suspension system help keep you safe by controlling the vehicle’s ride and handling. Part of the steering and suspension maintenance includes getting these systems checked regularly to see if car suspension repair is necessary. As your vehicle ages, the parts within the steering and suspension components wear out and may require replacement over time. Because of this, a regular suspension check and steering adjustment are needed. Trust your car suspension repair and auto repair needs to Milex — find your nearest location today! It is crucial to have your suspension system working properly, because by absorbing the energy and helping prevent damage to your vehicle’s undercarriage and body, it is what helps your vehicle react to bumps in the road. If your suspension components are damaged or worn out, your vehicle may not respond safely to flaws in the road. If you notice loss of control in your vehicle, let the experts at Milex inspect your suspension system and provide quality car suspension repair when necessary. As we all know, the steering system helps us direct our vehicle where we want it to go. As with the suspension, your steering components should also be inspected regularly by auto repair experts like Milex. You can also keep your steering system performing at its peak by maintaining the power steering fluid. The fluid is needed to help lubricate and transmit pressure in the power steering system. If you notice that your vehicle is pulling to a certain side or you notice noise or vibration when turning the steering wheel, you need to visit a Milex Complete Auto Care expert, as you may need to replace your steering fluid or have the steering system checked by our auto repair experts. At Milex, we understand how important a regular suspension check and steering inspection are to the safety of your vehicle, as well as the necessity of car suspension repair and comprehensive auto repair. Whether you own a domestic or foreign car or a diesel, hybrid or luxury automobile, the experts at Milex can see to it that your car is road-ready with full auto repair services, including car suspension repair. For details about our suspension repair, auto repair, or steering checks, find your nearest Milex to speak to an auto repair expert. When should you service your steering/suspension? Steering fluid flushes are recommended every 25,000 miles or according to manufacturer guidelines. Any time you notice poor handling or reduced steering performance, have the system inspected immediately to see if you need auto repair. 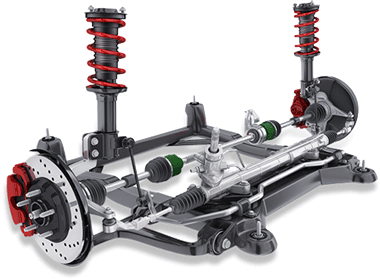 What causes wear and tear on the suspension system? Normal everyday driving causes wear and tear on the steering and suspension system. The extent and rate of the wear and tear are affected by driving habits, operating conditions, type of system, and frequency of maintenance. The professionals at Milex can tell you if you need suspension repair or other auto repair services.